MODA 360, an innovative exhibit of art, fashion and film from across the globe, promises brilliant fashion and art collaborations and the world premiere of Luut, a limited edition collection of fashion pieces made with currency. Moda 360 is open to professionals, press and public, April 4-5, 2016 at The New Mart in Downtown LA, featuring late afternoon trunk shows both days. Moda 360 promises high style in edited collections, exciting art and fashion exhibits, thought provoking talks and films, and a beautiful recreation of a bygone era on the runway. Moda 360 is a fusion of art, fashion and film, incorporating exhibits and live presentations and encouraging collaborations between the three creative industries. Talented artists from the Los Angeles Art Community will exhibit their work alongside designers from Colombia, Malaysia, Indonesia, UK, US, Canada. Nine UK designers are creating a “Best of Britain” exhibit, spotlighting key pieces in their collection. Organized by Lucy Tammam, Creative Director of Atelier Tammam, this special exhibit focuses on sustainability, destroying the notion that ethical fashion is basic and boring. Atelier Tammam couture fashion has been seen on red carpets, including the BAFTA awards, and along with Best of Britain exhibitors sportswear company Outsider and vegan footwear collection Bourgeois Boheme, enjoys a celebrity following: Natalie Portman, Bryan Adams, Elizabeth Moss and Emma Thompson sport Best of Britain creations. Also joining the British style invasion are contemporary sportswear company, Nancy Dee, bespoke footwear creations by internationally known Hetty Rose, sustainable dresses and sportswear by Deborah Campbell Atelier, tailored outerwear by Cecilia Hammarborg, business and after 5 fashion by Kitty Ferreira and fine jewelry by Michelle Krausz. Natasha Andreicheva handbags will be featured in Linger Magazine’s “Jazz Garden” runway presentation, along with contemporary designs by Atelier Tammam and Eweline B to evoke this vintage era. Juan Pablo Martinez is a Colombian designer who began his career in the atelier of Christian LaCroix. He brings his exquisite design and construction to womenswear, returning to Moda 360 with his eponymous ethical fashion brand. Representing Canada is award winning fine jewelry designer Yuliya Chorna. Polish designer Eweline B is showing her high end but affordable dresses and sportswear, and Philadelphia company Smak Parlour brings their fun and flirty ready to wear in whimsical prints. Earth Heir, from Malaysia, is showing a line of exquisite ikat woven clutches, and Ono Creations, from Indonesia, is exhibiting their collection of beautiful lifestyle bags made from cork. Moda 360 celebrates the innovation and creativity of designers and artists and welcomes exciting new innovations and ideas. Returning to Moda 360, Talk Design from Philadelphia will show their latest collection of prism jewelry that debuted last year to enthusiastic reviews. Made from reclaimed optical glass, these sleek and modern designs refract light, making not just a fashion statement, but demonstrating the wonders of science. Vanessa Wishart from Toronto, Ontario, is a fashion artist, designer and costumer for theater, films and music tours. Internationally known for her ability to take the most banal trash and transform it into wearable art, she has developed a patent pending technique for creating fashion items from currency, launching her Luut collection at this event. She is creating high end pieces for an installation at Moda 360 as well as a limited group of accessories, all available for preorder throughout the event. 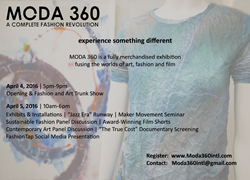 Moda 360 is offering an exciting line up of US artists exhibiting with international fashion designers. Talented artists from the Downtown LA Arts District are supporting the LA edition of Moda 360, giving the event an infusion of Los Angeles culture and spirit. Photographer Jenny Amaya is exhibiting her photo series exploration of human form and body art, abstract artists Clara Berta and Andrea Bogdan are showing their different perspectives and subject matter in their use of strong color and shape, and Andrea will debut an art and fashion collaboration. Ann Mitchell, a mixed media artist creates not only art, but the canvas on which she works, hand-making paper for her fabric and fiber art. Jonna Lee looks to unusual media to express the interaction of color and form, creating pieces from a silicone based medium that blur the line between painting and sculpture. Ching Ching Cheng transforms common lifestyle items into sculptures that reflect the differences in culture and adaptation to new social mores in her apron sculpture series. Dana Ellyn does not shy away from social statements in her hard-hitting artwork. Dana and fashion designer Lucy Tammam have created a new installation, a commentary on fashion and food, which will make its West Coast debut at Moda. Artist Justin Bolton is offering a look at the creation of art; he will be live painting throughout the event. Artist Molly Conn lets her imagination run wild in her subject matter – her cupcake sculpture will be exhibited with fashion collection Smak Parlour, and is debuting a new, interactive sculpture at Moda. Moda 360 features contemporary art and fashion and offers clothing, accessories, fine and semi-precious jewelry for sale and special order during a trunk show each day. Moda 360 promises an eclectic program representing three creative industries and presenting the ideas, inspiration and ethics that drive the independent artist, designer and filmmaker forward in their career. Moda 360 shows the best of contemporary creation, and gives a look behind the art to show the contribution these talented exhibitors offer the commercial and cultural market. About bel essence - Bel Essence is a natural skin care collection based on a simple idea: give skin the nutrition it needs to heal, regenerate and rejuvenate itself. Bel Essence combines natural and organic oils that are the richest sources of vitamins, antioxidants, omega 3's and fatty acids, the essential components for healthy, youthful skin. Bel Essence gives skin what nature intended and selects and combines oils with beneficial properties to maximize results without harmful chemicals and colorings. Natural oils, known for their skin health benefits, are combined to treat and nourish skin giving both instant improvement and long term transformation. Learn more at http://www.belessence.com.